Note that this module is not a standard part of HYDRUS (2D/3D). It is a nonstandard extension that we share with HYDRUS users without guaranteeing its numerical stability and robustness. Also, note that the earlier version (version 1) does not support all processes that the latter version (version 2) does. Warning: This boundary condition, i.e., the atmospheric boundary condition with overland flow, is less numerically stable than the regular atmospheric boundary condition! Water flow and transport on a hillslope is a complex nonlinear problem. Precipitation water infiltrates into the soil profile at a rate that is equal to the rainfall rate until the soil infiltration capacity is reached. Surface runoff is generated once the soil infiltration capacity is exceeded. Surface runoff redistributes water at the land surface and moves it to lower parts of the hillside where it can infiltrate providing there is larger soil infiltration capacity. HYDRUS software package (its two-dimensional computational modelu) (Šimůnek et al., 2006) has been modified so that it can now simulate overland flow. For that purpose the existing numerical solver for subsurface flow was coupled with the newly developed overland flow routine. The updated HYDRUS program was tested using multiple examples given below. The overland flow module does not consider solute transfer from the soil into the surface water layer present during overland flow. Infiltrating water from the surface layer is assumed to have concentration equal to the specified boundary condition concentration. Download a brief description of implementation of overland flow into HYDRUS, as well as selected test examples below (pdf). Download the executable module h2d_calc.exe, which considers overland flow (HYDRUS Version 1 and (Version 2). To use this module, copy h2d_calc.exe into the folder where HYDRUS (2D/3D) is installed (After first making a backup of the standard h2d_calc.exe for future use!). Test1 Transect dimensions: 100*0.5 m, q=0.00666 cm/s, N=201, T=600 s, slope=0.01, n=0.01.+ Regular Hydrus-2d is run without the overland flow. Excess water is removed instantaneously. Test2 The same conditions as for Test1, but with the enabled overland flow. Loam with very low Ks=2.8889e-09 cm/s. Comparison with the analytical solution. Test2a The same conditions as for Test2, but with Ks=2.8889e-06 cm/s, T=300 s, and simulation time = 3600 s. This run considers larger infiltration and also simulates the overland flow recession. Test2b The same conditions as for Test2a, but with Ks=2.8889e-05 cm/s. Test2c The same conditions as for Test2b, but with roughness of 0.05 for nodes with x < 50 m and 0.01 for nodes with x > 50m. Test2d The same conditions as for Test2a, but with evaporation. Test3 The same conditions as for Test2, but with Ks=2.8889e-04 cm/s, i.e., regular loam, T=300 s, and simulation time of 3600 s.
Test4 Surface runoff with multiple rainstorms (otherwise the same conditions as for Test3). Transect dimensions: 100*0.5 m, q=0.00666 cm/s, N=201, T=600 s, slope=0.01, n=0.01, ET=0.4 cm/d. Test5 The same conditions as for Test3, but with variable slope, i.e., Ks=2.8889e-04 cm/s, regular loam, T=300 s, and simulation time of 3600 s.
Test6 The same conditions as for Test3, but with inflow at the upper end of the slope, i.e., Ks=2.8889e-04 cm/s, regular loam, T=300 s, and simulation time of 3600 s.
Test6s The same conditions as for Test6, but with solute transport, i.e., Ks=2.8889e-04 cm/s, regular loam, T=300 s, and simulation time of 3600 s.
MultiLay The same conditions as for Test3, but with Ks=2.8889e-02 cm/s for the material in the middle of the transect. This run generates overland flow in one section of the transport domain and allows infiltration in another. MultiLaZ The same conditions as for MultiLay, but with the slope in the opposite direction. MultiMat The same conditions as for MultiLay, but with the each material repeated four times within the transect. Test2Sr The same conditions as for Test2, but with T=300 s, and simulation time T_end=3600 s. Solute of unit concentration in rainfall in the top half of the domain. Test2bSr The same conditions as for TestSr, but with Ks=2.8889e-05 cm/s. T=300 s, T_end=3600 s. Solute of unit concentration in rainfall in the top half of the domain. Test2Si Uphill inflow (h_Top=1 cm) with a concentration of 0.5 (c=0.5) for T=300 s, and simulation time T_end=3600 s.
Test2Sri Both uphill inflow (h_Top=1 cm) with a concentration of 0.5 (c=0.5) and rainfall with a unit concentration for T=300 s. Simulation time T_end=3600 s.
Irreg Transect dimensions: 100*2.0 m, q=0.00666 cm/s, N=544, T=600 s, simulation time = 3600 s, average slope=0.02, n=0.01, regular loam. Irregular surface of the transport domain. Irreg1 Transect dimensions: 50*1.0 m, q=0.00666 cm/s, N=425, T=600 s, simulation time = 3600 s, average slope=0.08, n=0.01, regular loam. Irregular surface of the transport domain. Irreg2 The same conditions as Irreg1, but with fixed vertical discretization at the soil surface using internal lines. Irreg3 The same conditions as Irreg2, but with finer discretization. Irreg4 The same conditions as Irreg3, but with time units of days. Irreg5 The same conditions as Irreg4, but with multiple rainstorms. + q - rainfall, N - number of surface nodes, T - duration of the rainfall, T_end - simulation time, n – surface roughness, h_Top - inflow depth. 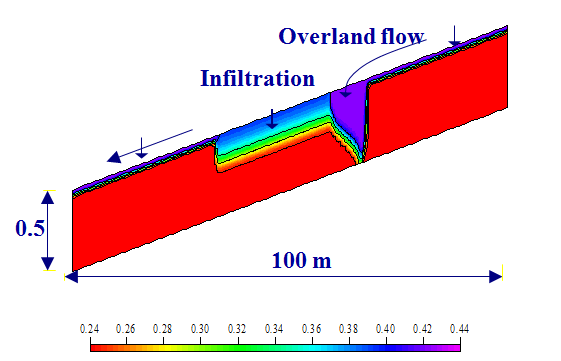 Šimůnek, J., Implementation of Overland Flow into HYDRUS (2D/3D), HYDRUS Software Series 6b, Department of Environmental Sciences, University of California Riverside, Riverside, CA, 44 pp., May 2015. Šimůnek, J., HYDRUS-2D Code Modification: Modeling Overland Flow and Dynamic Interactions Between Plants and Water Flow in a Hillslope Transect, Idaho National and Environmental Laboratory, Final report for project under contract number 00021013, 55 pp., 2003.
van Genuchten, M. Th., and J. Šimůnek, Integrated modeling of vadose zone flow and transport processes, Proc. Unsaturated Zone Modelling: Progress, Challenges and Applications, Eds. R. A. Feddes, G. H. de Rooij, and J. C. van Dam, Wageningen UR Frontis Series, Vol. 6, Chapter 2, pp. 37- 69, x-xi, Kluwer Academic Publishers, Dordrecht, The Netherlands, 2004. Köhne, J. M., T. Wöhling, V. Pot, P. Benoit, S. Leguédois, Y. Le Bissonnais, and J. Šimůnek, Coupled simulation of surface runoff and soil water flow using multi-objective parameter estimation, J. of Hydrology, 403, 141-156, 2011.